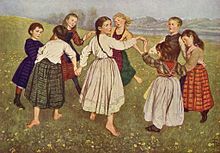 Meredith is pursuing one of her passions–teaching circle dancing–today. She’s invited to lead and teach at a Quaker retreat in the Pyrenean foothills tonight. So–I can have chicken wings for supper without pause. Meredith is not so keen on this fingerlicking special treat. There’s a recipe for them in my book that uses lots of black pepper. This is a different one with garlic, allspice, cinnamon, and a little cayenne–we’ll see. I’m reckoning on four for each person. Put in the wings and turn them over until they are thoroughly coated in it. Leave them to marinade for at least an hour. Cover a shallow oven tray with foil and brush it with oil. 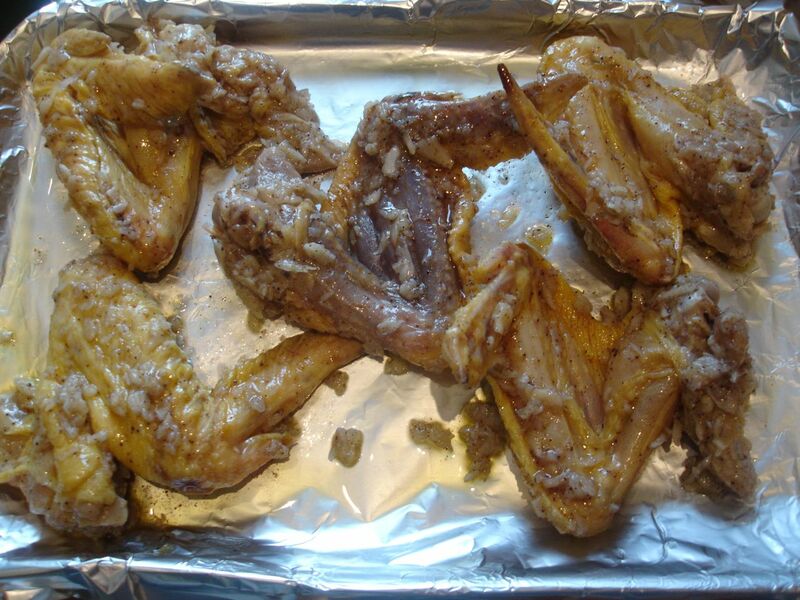 Lay the wings out on the tray. Roast them for 45 minutes. Turn up the heat to 200C/400F. Continue roasting for a further 5 minutes–then take them out of the oven. I’m told that home-made mayonnaise goes very well with them–but I couldn’t possibly comment. so they can do some fingerlickin’.. Sorry, just having a bit of fun…. but the recipe sounds nice though, will try it soon! I really love chicken wings, the spicier the better. But other members of my family are not so keen on the hot stuff, so I’ll have to try out your recipe, Robin. With a 1/4 t of cayenne, they should be decently hot without being overpowering? Hooray and thanks for another wonderful recipe! I love the addition of cinnamon here! It would never have occurred to me. I thought I had landed on the wrong webpage! Your recipe and attractive photos were accompanied by a picture of an enormous doughnut with brilliant pink icing and the the caption “Słodkie pyszności” (“Delicious sweet things”) – an advertisement for a local confectioners courtesy of Google Ads (I’m a Brit living on the Baltic Coast of Poland). How could anyone be tempted by such a monstrosity after seeing it juxtaposed with your true “pyszności.” It blighted the aesthetically pleasing experience of reading your blog. I did an episode of the Swedish “Wallender” series some years ago and we filmed across the water from you at the southern tip of Sweden in Ustad. I was a Poldark fan in here in Oz back in the last century and only recently re-watched the whole series on DVD – just as exciting after all these years. Then I googled the cast to catch up and found you here. Seems like meeting an old friend. 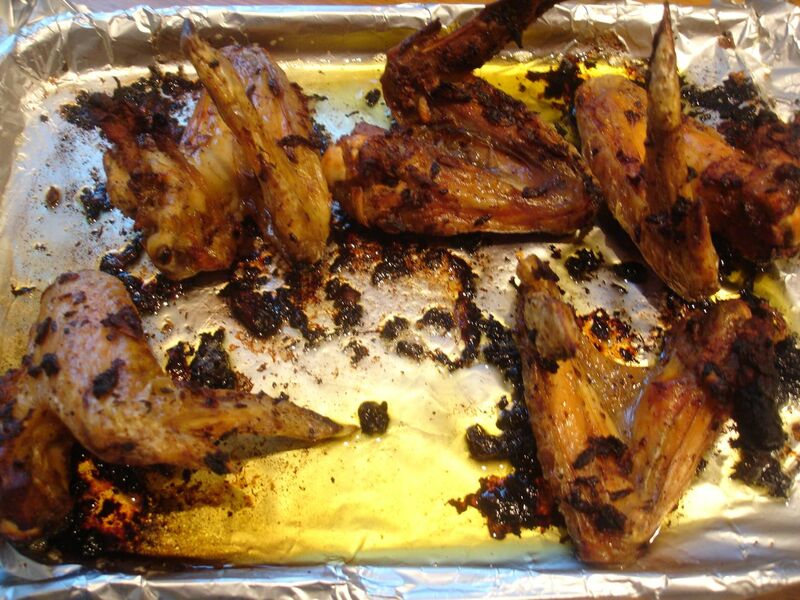 I cooked your chicken wings for friends last night and they were much enjoyed – a softer heat than the chili-based marinade I usually make for chicken. Served it with chunks of Queensland Blue pumpkin drizzled with the marinade and roasted, and with a dollop of creme fraiche and a rocket salad. All washed down with a couple of bottles of crisp Aussie Verdelho. A wonderful meal, and we all fondly reviewed Poldark and all things Cornish. Thanks for the memories and best of luck with your book. Thanks, Karen–sounds like you eat really well chez vous! “Queensland Blue pumpkin”–intriguing–I guess it loses colour when cooked? Sorry, didn’t mean to confuse you – the Queensland Blue is an Aussie variety (the same shape as usually depicted in drawings of Cinderella’s pumpkin-turned-coach). The ‘Blue’ refers to the shiny, blue-grey coloured skin on a large, ribbed, orange-fleshed pumpkin. The flesh is quite dense but sweet and the large seeds are great for roasting as a highly nutritious snack. Yum! I can’t wait to try this recipe. It should be a good addition to our Labor Day menu.